It has been widely recognised in scholarship that the Deuteronomistic History (Deuteronomy to 2 Kings 25) was written to explain why the states of Israel and Judah both failed, attributing the reasons for the failure to their kings' disobedience regarding the demand of cult centralisation (Dt. 12) and keeping idolatry at bay (Dt. 13). This article argues that material questions (e.g. land and economic existence) are integral to the history and that the monarchy' s failure to care properly for the poor can be added as a further reason for the demise of Israel (north and south). As such the history not merely narrates the political history of (early) Israel, but also conveys a socio-ethical message. The Genesis to 2 Kings 25 narrative (cf. Miller & Hayes 2006:73), which in its first part (the Pentateuch) contains the Mosaic law, can be regarded as ancient Israel' s first history. The Chronicler, of course, is the second. Below we will limit our discussion to the Deuteronomy to Kings narrative or what Noth (1981) distinguished as the Deuteronomistic History (cf. also Kaiser 1984:172-177; Gottwald 2014:299). The eventual exile and ruin of Jerusalem are usually ascribed to most of the kings' failure to obey the Deuteronomic prescription to centralise the cult (Dt. 12)2 and not to serve other gods (Dt. 13, cf. Otto 2016).3 There seems to be consensus on this point and it is not the purpose of this article to contend it. However, we argue below that there is also another case of royal disobedience which the macro-text of Israel's first history offers as a reason for the exile, namely the kings' obligation to care for the poor. However, this aspect is mostly ignored by European middle-class scholarship (similarly by the white section of the South African population). This may be due to the adage of the Talmud that we don't see the world as it is, but as we are. Or to put it a bit bluntly: we don't see the poverty motif in the Deuteronomistic History because our stomachs are full. In comparison to other ancient Near Eastern annalistic histories (e.g. from Assyria and Babylonia, cf. Wiseman 1958:46-84) in which the kings are usually glorified and lauded for their mighty deeds, Israel' s first history about her kings is unique in its self-criticism regarding the Deuternonomic obligation to care for the poor. Ironically, perhaps for this very reason (amongst others), Israel's first history had the most influential Wirkungsgeschichte in humanity in comparison with other ancient Near Eastern histories. To discuss this thesis I will look for a link between Deuteronomy 17:14-20, 1 Sam. 2:1-10; 2 Sam. 8:10-17; 2 Sam. 24:10-24, and 1 Kings 21 (or the royal law, Hannah's song, Samuel's warning, the good David, and Ahab and Naboth). "I will set a king over me, like all the nations that are around me,"
you are not permitted to put a foreigner over you, who is not of your own community. "You must never return that way again." he shall have a copy of this law written for him in the presence of the Levitical priests. so that he and his descendants may reign long over his kingdom in Israel. As our previous analysis indicates (Scheffler 2007:127) verses 15a-20a state nine conditions for kingship in Israel. From a synchronic perspective the kingship would be in the future after the settlement, but from the ex eventu view of the author(s) of the Deuteronomistic History (hence DH) the history of Israel is already embedded in the text. The text as it were dialogues with all the history of all the kings mentioned in the Deuteronomistic History. The first two conditions (verse 15) regard the eligibility for kingship: YHWH should choose him and he should be a male compatriot. Conditions 3 and 4 (verse 16) pertain to the social limitations of the king's power: it is directed against excessive military power and exploitation and oppression of the citizens. Conditions 5 and 6 (verse 17) regard personal limitations to the king's power and warn against distractive sexuality (too many wives) and excessive wealth ( ). Conditions 7-9 (verses 18-20a) deal with the king' s obliged submission to the divine (Deuteronomic) law: he must have a copy ( ) and continuously read the law ( ), he must observe the law and fear God ( ) and must minutely act according to its prescriptions ( ) in order not to oppress his fellow citizens ( ). Especially three conditions are relevant for our theme: the king should not be too rich, he should read and act according to the (Deuteronomic) law, and not exploit and oppress his citizens (who are his brothers). Von Rad (1968:86) remarks correctly that in comparison to Psalms 2; 20; 45; 72 and 110 the power which the king should have according to Dt. 17:14-20 is extremely restricted. Especially Solomon (who is painted in all his glory initially, cf. 2 Ki. 3) in the end did not pass the Deuteronomic test: he gathered too much wealth, allowed idolatry because of his excessive polygamy6 and oppressed the people with forced labour. Every seventh year you shall grant a remission of debts. who is a member of the community, because YHWH's remission has been proclaimed. on whatever any member of your community owes you. this entire commandment that I command you today. you will rule over many nations, but they will not rule over you. do not be hard-hearted or tight-fisted toward your needy neighbor. willingly lending enough to meet the need, whatever it may be. "The seventh year, the year of remission, is near,"
your neighbor might cry to the LORD against you, and you would incur guilt. YHWH your God will bless you in all your work and in all that you undertake. 11 Since there will never cease to be some in need on the earth, I therefore command you, "Open your hand to the poor and needy neighbor in your land." The Song of Hannah (1 Sam. 2:1-11) occupies a prominent position at the beginning of the history of Samuel (her son) and the subsequent kings. Of course its relation to Samuel and (through the latter to the kings) as well as the motif of the overcoming of her infertility is of cardinal importance for the interpretation of the text. Notwithstanding, as a poem it is a programmatic text which reveals the Deuteronomist's views regarding poverty and God's relation to the poor (although he might have incorporated it from a source, cf. Hertzberg 1973:20). To appreciate this we quote the text and emphasise phrases relevant to our theme. The poem consists of three sections. Verse 1-3 praises God for his actions, verses 4-9 describe these 'typical actions' which consists in the inversion of power relationships and 910 emphasise his power. Although the song in its present context of the Samuel story is a hymn which praises God for taking away Hannah's infertility, the theme of poverty functions more prominently. The poor are mentioned at least six times in verses 4-9 and different terms and expressions are used to refer to them (hire out for bread, hungry poor, low, poor, needy). The song creates link between childlessness and poverty: God can cancel the latter, therefore also childlessness. It is important to note the free choice of God. He can do what he wants. Because he has this free power (and can push people into Sheol and take them out), he is able to care for the poor and the needy. And it is repeatedly stated that it is his preference to change the situation of the poor. His free choice and power are therefore linked to his compassion. It appears as if the song was initially about changing the fate of the poor, and that 5b (about making women fertile) was added in view of applying the Song to Hannah' s situation. This need not be, because it is explicitly stated that YHWH exalts and brings low, and that covers both poverty and barrenness. In verse 10 the song reminds the reader of the role of the (messianic) king. God gives him power, but a good relationship with the poor is the pre-supposition since God "make[s] the poor sit with princes". No wonder that Luke's Gospel bases much of Mary's Magnifcat on this song, since in his Gospel it has a similar function, pre-empting the Lukan Jesus's intensive care for the poor (see Scheffler 1993:50-51). The fact that the king and his role regarding poverty is explicitly mentioned in verse 10b, provides the clue that Hannah's Song with its emphasis on changing the fate of the poor can or should be read in intertext with Deuteronomy 15 and 17. 12 and he will appoint for himself commanders of thousands and fifties, and some to plough his ground and to reap his harvest, and to make his implements of war and the equipment of his chariots. 15 He will take the tenth of your grain and of your vineyards and give them to his officers and to his servants. 16 He will take your menservants and maidservants, and the best of your cattle and your asses and put them to his work. Otto (2016) in his excellent commentary of Deuteronomy indicated the intertextuality between the king's law of Dt. 17:14-20 and Samuel's warning in Sam. 8:11-17.10 The following table endeavours to provide a synoptic overview of the parallels. Military service, forced labour, oppressive taxes, enslavement - all refer ultimately to extreme poverty amongst the people. In short: the king, although leading the people in battle (1 Sam. 8:20), will cause poverty amongst his subjects. The report on the kings' history (and their failure) that follows is therefore not only a report of their idolatry (mentioned in Dt. 17 but not in 1 Sam. 8:11-17), but also their economic exploitation of the people, their failure to adhere to the demands of Dt. 15:1-11. Especially Solomon's practices as described in 1 Ki. 10-11 has such a resemblance to 1 Sam. 8:11-17 that it seems as if the Deuteronomistic authors' criticisms of Solomon were incorporated into 1 Sam. 8 (e.g. Jones 2001:204) just as they were incorporated into Dt. 17:14-20 (see above). According to the Deuteronomistic authors most kings failed to meet the criteria for kingship, but David, Hezekiah and Josiah are mentioned as notable exceptions. 2 Sam. 24:10-24 reports positively on David' s care for the poor, and as such it is a countertext to the Ahab text that follows in 1 Ki. 21. David, despite his missteps (cf. besides the census also the Uriah incident), had the (economic) interests of the people at heart and according to 2 Sam. 24:10-24 "did not exalt himself above the people" (Dt. 17:20), taking cognisance of the Deuteronomic law (Dt. 17:17-20). The relatively unknown text is quoted here and the relevant 'economic' phrases highlighted. 10But afterward, David was stricken to the heart because he had counted the people. David said to YHWH, "I have sinned greatly in what I have done. Three things I offer you; choose one of them, and I will do it to you." "Shall three years of famine come to you on your land? Or will you flee three months before your foes while they pursue you? Or shall there be three days' pestilence in your land? Now consider, and decide what answer I shall return to the one who sent me." but let me not fall into human hands." and seventy thousand of the people died, from Dan to Beer-sheba. "It is enough; now stay your hand." The angel of YHWH was then by the threshing floor of Araunah the Jebusite. but these sheep, what have they done? Let your hand, I pray, be against me and against my father's house." "Go up and erect an altar to YHWH on the threshing floor of Araunah the Jebusite." 19 Following Gad's instructions, David went up, as YHWH had commanded. and Araunah went out and prostrated himself before the king with his face to the ground. 21 Araunah said, "Why has my lord the king come to his servant?" and the threshing sledges and the yokes of the oxen for the wood. 23 All this, O king, Araunah gives to the king. " And Araunah said to the king, "May YHWH your God respond favorably to you." 24 But the king said to Araunah, "No, but I will buy them from you for a price; I will not offer burnt offerings to YHWH my God that cost me nothing." So David bought the threshing floor and the oxen for fifty shekels of silver. The situation of the narrative of 2 Sam. 24:10-24 is the punishment of David for the census he conducted. Being "a man after God's heart" therefore does not imply David's impeccability, but his remorseful and positive attitude while being punished. The punishment had implications for the economic and existential well-being of his people (and their animals!, cf. 17), and David is portrayed as taking these concerns to heart. Being offered a choice between three punishments (famine, persecution and pestilence), David did not choose poverty for his people but pestilence (by implication) which he thought could be tempered by YHWH's mercy. When it proved to be a disaster (70000 people died), David relented and (for the benefit of his people) asked YHWH to be punished alone. The people are innocent, and David expresses this by movingly referring to the innocence of the sheep (pars pro toto for the animals and not metaphorically meant). David is portrayed as succeeding in changing YHWH' s mind. The plague abated. The rest of the narrative is interwoven with the buying of Arauna'a threshing floor (that the future temple would be built there emphasises its importance) and further illustrates David' s positive attitude especially with regard to money matters. Whereas it is warned in 1 Sam. 8:10-17 that the king would confiscate the property of his subjects, David here acts to the contrary: Arauna offers him the threshing floor for free, but David insists on paying for it (2 Sam. 24:24). David is not greedy and in the larger narrative appears to be the opposite of his son Solomon (1 Ki. 10-11) and king Ahab (1 Ki. 21). The well-known (prophetic, see Deist 1991:48) narrative of Ahab and Naboth's vineyard (1 Ki. 21) is the example par excellence of a king that acted contrary to Dt. 15:1-11 and Dt. 17:14-20, and in accordance to Samuel's prediction in 1 Sam. 8:10-17. Despite its being well-known it is (for the benefit of the following discussion) being quoted in full with phrases containing the poverty motif highlighted. Naboth the Jezreelite had a vineyard in Jezreel, beside the palace of King Ahab of Samaria. or, if it seems good to you, I will give you its value in money'"
3 But Naboth said to Ahab, "YHWH forbid that I should give you my ancestral inheritance. " for he had said, "I will not give you my ancestral inheritance." He lay down on his bed, turned away his face, and would not eat. "Why are you so depressed that you will not eat?" I will give you another vineyard for it'; but he answered, 'I will not give you my vineyard.'" 7 His wife Jezebel said to him, "Do you now govern Israel? Get up, eat some food, and be cheerful; I will give you the vineyard of Naboth the Jezreelite." she sent the letters to the elders and the nobles who lived with Naboth in his city. 'You have cursed God and the king.' Then take him out, and stone him to death." 12 they proclaimed a fast and seated Naboth at the head of the assembly. "Naboth cursed God and the king." So they took him outside the city, and stoned him to death. Jezebel said to Ahab, "Go, take possession of the vineyard of Naboth the Jezreelite, which he refused to give you for money; for Naboth is not alive, but dead." Ahab set out to go down to the vineyard of Naboth the Jezreelite, to take possession of it. he is now in the vineyard of Naboth, where he has gone to take possession. 19 You shall say to him, "Thus says YHWH: Have you killed, and also taken possession?" In the place where dogs licked up the blood of Naboth, dogs will also lick up your blood." 20 Ahab said to Elijah, "Have you found me, O my enemy?" because you have provoked me to anger and have caused Israel to sin. 24 Anyone belonging to Ahab who dies in the city the dogs shall eat; and anyone of his who dies in the open country the birds of the air shall eat." 25 (Indeed, there was no one like Ahab, who sold himself to do what was evil in the sight of YHWH, urged on by his wife Jezebel. he fasted, lay in the sackcloth, and went about dejectedly. 29 "Have you seen how Ahab has humbled himself before me? Because he has humbled himself before me, I will not bring the disaster in his days; but in his son' s days I will bring the disaster on his house. " According to the archaeological record (see Deist 1987:68-88; Miller & Hayes 2006:303313) Ahab was an economically successful king. However, according to the biblical text he was greedy and corrupt. Several aspects, relevant for our theme, deserve our attention. ■ Firstly, it should be kept in mind that the story is not merely between a rich Ahab and a poor Naboth. Naboth owned a vineyard and Ahab offered to buy it from him. The story is rather about a rich and greedy (forbidden in Dt. 17:14-20) Ahab who wanted to infringe on the rights of a free Naboth (contra the limitation in Dt. 17:20), who if he conceded was in danger of becoming impoverished. Jezebel orchestrates the elimination of Naboth (reminding of the warning that women could lead a king's heart astray, Dt. 17:17), and Ahab does not prevent Jezebel in murdering in order to steal. ■ Secondly, Elijah confronts Ahab prophetically, thereby being a precursor for later prophets especially who campaigned for social justice, e.g. Amos, Micah, Isaiah and Jeremiah (see Van Heerden 2012). In DH' s portrayal of Elijah' s life the latter mirrors opposite values than Ahab: through his caring for the poor widow (1 Ki. 17:7-16) he obeys the Deuteronomic law. ■ Thirdly, the parenthetic incorporation of 1 Ki. 21:25-26 also reflects that Ahab stood in the line of most of the kings in the Deuteronomistic History who were judged in terms of their idolatry. But the Deutoronomistic authors also included the narrative as a whole that testifies to the fact that in Ahab' s case his greediness and oppression of the poor aggravated the judgment on him: "there was no one like Ahab, who sold himself to do what was evil in the sight of YHWH" (1 Ki. 21:25). ■ Fourthly, it is often overlooked by readers who only judge Ahab negatively (maybe due to verses 25-26) that he repented and that he received some forgiveness. The text therefore also has the message that penitent oppressors' punishment could be mitigated. However, Ahab's actions had disastrous consequences for his dynasty, thereby conveying the serious message that the exploitation of the poor inevitably has negative social consequences which cannot be annulled by mere personal pardon. ■ indicates that socioeconomic wrongs are also religious wrongs and thus punished by God. The perspective of the Deuteronomistic narrator in is thus clear: God sides with the poor and the marginalised. Even if a monarchy would be allowed to replace a theocracy (1 Sam. 10), this does not imply that power may violate justice. The treatment of the poor serves as a criterion to judge the kings when Israel's first history is written. in the land that I gave of old to your ancestors forever and ever. 8 Here you are, trusting in deceptive words to no avail. 10 and then come and stand before me in this house, which is called by my name, and say, "We are safe!" -only to go on doing all these abominations? 11 Has this house, which is called by my name, become a den of robbers in your sight? You know, I too am watching, says YHWH. In considering this prophecy, one should note that the care for the alien, orphan and the widow, the poorest of the poor, is at the top of the Deuteronomistic Jeremiah's list. Compared to what we have discussed thus far, Israel's first (Deuteronomistic) history reflects prophetic socio-political criticisms. The label 'Former Prophets' can therefore be regarded as appropriate, since Joshua - 2 Kings can be typified as "prophetic history writing", not only because it contains the Elijah-Elisha cycle, but because it shares the values (regarding socio-ethical matters) with the later major and minor prophets. According to the Deuteronomistic History political power is subject to the Deuteronomic law in which the fate of the poor is taken seriously (Dt. 15:1-11; 17:14-20). The king has the task of caring for the poor (cf. also Ps. 72:4, 12, 13).14 If the king does not do it, it amounts (just as idolatry) to religious transgression which can lead to catastrophic consequences, such as the destruction of Jerusalem and the exile (2 Ki. 25). In the Ancient Near East (e.g. Assyria and Babylonia) the king also had the obligation to care for his people. However, in the narration of their histories, the kings are usually praised, especially for their military successes. Israel's first history is self-critical, unique in not glorifying its kings. The kings are judged and criticised according to Deuteronomistic criteria which demand loyalty to God (Dt. 6:4; 13) which in itself implies love for the neighbour (Lev 19:18), especially those that suffer (Dt. 15:1-11). Not only specific smaller units of the text, but their intertextual function in the macro-text of Israel's first history conveys this self-critical message. This self-criticism has an implication for contemporary history writing in the (post)modern world, especially those histories that are taught to children at school. Are they prophetic and self-critical, not merely serving the interest of the powers that be, but also communicating (also by narrating past failures) values that will contribute to a peaceful and caring future society? 1 With appreciation I dedicate this contribution to Hendrik Bosman, with whom I could have many stimulating discussions and who took a special interest in the question of poverty in South Africa. The volume which he initiated and of which he was co-editor (Bosman et al. 1991) has a special relation to this article (various discussions of 1 Ki. 21) and to my mind remains a landmark in Biblical Studies in the specific context of South Africa. 2 Dt. 12:13-14 summarise the demand for the centralisation of the cult: "Take care that you do not offer your burnt offerings at any place you happen to see. But only at the place that YHWH will choose in one of your tribes - there you shall offer your burnt offerings and there you shall do everything I command you." Most kings failed to obey this, with David, Hezekiah and Josiah as notable exceptions. 3 Dt. 13 polemicises vehemently against idolatry by prescribing that those that entice to serving other gods should be put to death: "If prophets or those who divine by dreams appear among you and promise you omens or portents, and the omens or the portents declared by them take place, and they say, "Let us follow other gods" (whom you have not known) "and let us serve them," you must not heed the words of those prophets or those who divine by dreams... YHWH your God you shall follow, him alone you shall fear ..." If anyone secretly entices you - even if it is your brother, your father's son or your mother's son, or your own son or daughter, or the wife you embrace, or your most intimate friend - saying, "Let us go worship other gods," whom neither you nor your ancestors have known, any of the gods of the peoples that are around you, whether near you or far away from you, from one end of the earth to the other, you must not yield to or heed any such persons. Show them no pity or compassion and do not shield them. But you shall surely kill them ..." The seriousness of the command is emphasised by the fact that even family members should be executed. Again most kings failed to obey this command (notably also Solomon) with David, Hezekiah and Josiah again the exceptions. 4 If the information in 2 Ki. 22:3 is correct the discovery was made in 622 BCE. 5 The texts to be discussed are supplied here to facilitate the discussion. In a previous contribution (see Scheffler 2007:124-137) I have reflected in more detail on Dt. 17:14-20 in terms of the synchrony and diachrony of the text. 6 It should be noted (especially by First World readers) that the text does not advocate monogamy but polemicises against distracting excessive polygamy. David, for example, is never criticised for his "moderate polygamy". 7 In a previous contribution (see Scheffler 2005) I have reflected extensively on Dt. 15:1-11 and its present-day relevance (see also Scheffler 2013:1-14). 8 From a materialistic, Marxist or liberationist perspective (cf. e.g. Mtshiselwa 2015) it can be argued that the Deuteronomist authors were from the elite and therefore underplayed the motif of poverty in favour of a religious or power-interest perspective in which the centralisation of the cult and exclusive religious thinking serve to control the thoughts of an otherwise exploited people. Even so it is remarkable that the positive attitude towards the poor surfaces (prominently) in the Deuteronomistic History as it does in the Pentateuch (Scheffler 2013a) and the Tanach as a whole (cf. Scheffler 2013b and the literature mentioned there). 9 1 Sam. 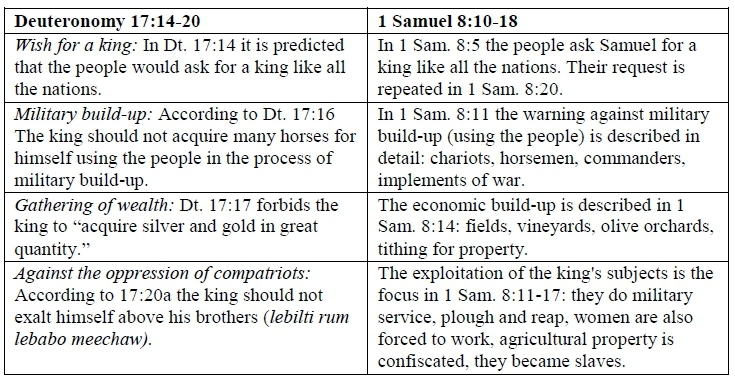 8:1-7 (about Samuel's "economic pervert" sons) constitutes a context in the narrated world of the present text for the warning which most probably had a separated (later) existence. 10 According to Otto (2016) 1 Sam. 8:8-10 provides the "exegetische Schlüssel" for interpreting 1 Ki. 17:14-20. Both texts are post-exilic and look back on history which is then presented on a synchronic level as the criteria for the future king (Dt. 17:14-12), the warning before its institution (1 Sam. 8:8-18), the institution (1 Sam. 10) and the report on the history of the (mostly failed) history of the kings 1 Sam. 11-2 Ki. 25. 11 Pyper (2014:366), most probably in search of an "original" or "novel" interpretation, relativises the Deuteronomistic antimonarchical view by interpreting the would-be king's actions positively: "... the king will organize the army, give their sons a proper military training, and even find occupations in his palace for his daughters. After years of uncertainty ... this is surely just what the people are asking for." Not merely the perspective of Samuel in 1 Sam. 11-18 as such is misread here, but also to our mind the Deuteronomistic history as a whole regarding the theme of poverty and oppression. Can this perhaps be ascribed to the North-European context of Pyper? 12 As Ahab did through Jezebel. 13 As most of the kings did, and Ahab also (1 Ki. 21:25-26). 14 Almost emotionally expressed in Ps. 72:12-13: "For he shall save the poor when they cry and the needy who are helpless. He will have pity on the weak and save the lives of the poor."